Today I’ll be catching a train to Wauchope (pronounced war-hope). It’s a seven-hour train journey from Sydney, due North. 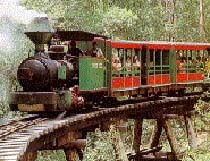 “On the Hastings River about 19km due west of Port Macquarie on NSWs central coastline, Wauchope is surrounded by Australias most extensive stands of blackbutt forest and is best known for the nearby Timbertown theme park. Designed around the timber industry which first put Wauchope on the map, Timbertown demonstrates wood-cutting and milling and has a working bullock team, smithy and steam train, along with a big exhibition hall.